Card Text Play: Deal 3 to a creature. If it is not destroyed, its owner discards a random card from their hand. If there are no enemy creatures in play, do I have to deal damage to a friendly creature in play? Yes. You always resolve as much of an ability as possible. Therefore, if there are no enemy creatures, you have to deal damage to a friendly creature. If you deal damage to a friendly creature and it is not destroyed, its owner (most likely you) also has to discard a random card from hand. 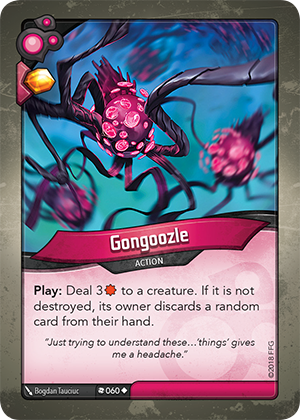 If I there are no creatures in play, may I still play Gongoozle to gain the Æmber bonus? If my opponent takes control of one of my creatures via another card (such as Collar of Subordination) and I damage (not destroy) it with Gongoozle, which player discards a random card from hand? You. The card indicates that the owner (not the controller) of the creature discards a card at random. Therefore, even though your opponent controls your creature, you remain the owner and would discard a card at random from your own hand.